Help TMCS by running the GNAR! Once again for 2019! ​​A costume contest! The GNAR even has a costume contest! You heard it right, pick a super fun, awesome name for your team when you register online. Then create your best costume to go along with your team name for a chance to win! Winners will be selected and announced at the race. Sunday, May 5th at Camp Ton-A-Wandah starting at 12pm (in the Gym). An awards ceremony will take place immediately following the race. 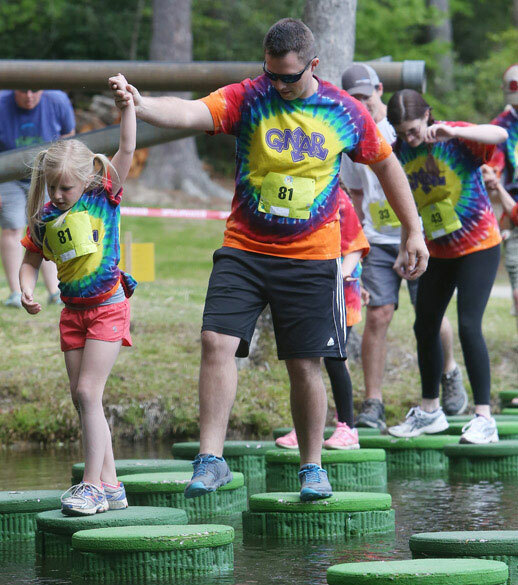 The 8th annual Gnarliest Kids Adventure Race (THE GNAR) offers kids, ages five through 14, the opportunity to experience the thrill of adventure racing (adults too). Teams of two will work together to navigate a variety of challenges. The course is TOP SECRET! Challenges may include mountain biking, running, a low ropes course, problem solving, a climbing wall, and a grand finale obstacle guaranteed to leave a perma-grin smile for your ride home. NEW for 2019! The past several years we have had a non-competitive category with a bike and without a bike and a Competitive Category WITH a bike. Our participants have asked for a COMPETITIVE category WITHOUT bike… so we have added this NEW category for the 2019 event! When you register, select the correct category! Make sure to pick the correct non-competitive category. There are two. One has a bike portion and one does not. Note: Both you and your teammate have to BOTH be part of this new category and register together! Looking for a mountain bike to ride at the GNAR? Contact Sycamore Cycles in Hendersonville and they can help you out! To make this years race the best GNAR yet we need our wonderful parents to participate in various volunteer opportunities. Thank you for everything you do! We look forward to seeing you on April 30th! Proceeds benefit The Mountain Community School whose mission is to create an educational environment where students are inspired to academic excellence and discovery. Teachers, parents, students, and the community work together to honor individuality and diversity, nurture respect for self and others, and foster a life-long love of learning.